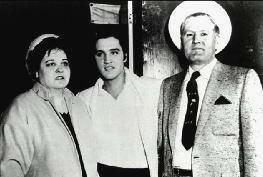 Elvis’ mother Gladys Love Smith was born on April 25, 1912 Pontotoc County, Mississippi. Gladys’ parents were Robert Lee Smith & Octavia Luvenia “Doll” Mansell. Octavia got her nickname “Doll” because she was a very beautiful & fragile woman. She gave birth to nine children. Was bedridden most of her life, dying at 59 from tuberculosis. Gladys’ father Robert was a handsome man with black hair. Vernon and Gladys Wedding He was a cotton farmer & an occasional moonshiners. He would pick up odd jobs to support his large family. I n his fifties, he died suddenly of pneumonia, leaving Gladys then 19 to work in Tupelo as a seamstress to help support the family. Gladys had black hair and dark eyes. As a youth she liked to play basketball. She played the position of forward and was very good at it. She also loved music and dancing. Vernon was tall and fair-haired. He, too, liked music and had a good singing voice. He also enjoyed working on cars. In Tupelo, Mississippi they met and fell in love. They eloped on June 17, 1933 and were married in Ponotoc County. 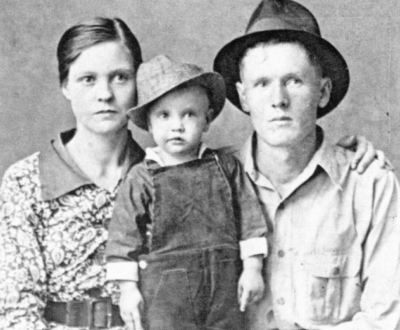 Their son Elvis, destined for fame, and his stillborn twin Jessie were born January 8, 1935 in their small home in Tupelo. The bond between mother, father and son was always strong. https://www.elvispresleynews.com/elvis-death/, When we went swimming, Elvis would have fits if he saw me dive. 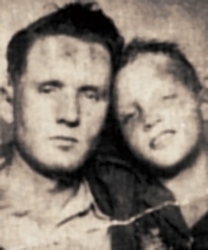 He was as afraid something would happen to me. The crisis of being separated from his father was noted when Elvis was about five years old. Round where we lived in East Tupelo seems there was a fire almost every night and wed all go running to see what we could do to help the people, Vernon tells. In her opinion a Coke bottle meant cash and candy to Elvis for he had seen other children collect them and take them to the store for refund. It was time to teach a lesson I asked him if Mrs. Harris had given him that bottle. When he admitted she had not his mother issued orders. You take it right back to her and tell her you stole it. Dejected he trudged off. A moment later the neighbor called across lots to say Elvis had done no wrong. Whats more, she had several more he might have. The usually gentle Gladys remained adamant. He has to learn, she said. Send him home. At home Vernon waited with a switch. His daddy didn’t hit him but two-three licks, says Gladys, But none of us ever forgot it.. Every teenager boy dreams of doing something terrific! Making that sudden and smashing success which will assure his place in the adult world. If he is so rash as to voice that dream he swiftly hears the adult counsel, “Dont kid yourself.” Yet, there was an 18-year-old lad, who lived in poverty, who dared to dream his dream and then one day in the summer of 1953 his dream came true. At 21 Elvis Aron Presley has become a national legend. Parents gossip about him. Critics argue about him. Rock n roll fans love him. His name showed four hit records simultaneously, all in first place on Top, Tunes and Talent. His is the fastest selling album RCA-Victor has ever issued. Sales of his “Heartbreak Hotel” are nearing the 2 million-dollar mark and his Hollywood screen test promises he will further enhance his fame when he becomes a motion picture star. It was in that setting that Vernon Elvis Presley and Gladys Love Smith fell in love. “We should have been in school but we eloped,” Gladys recalls. ” We didnt elope very far. We just went down the road five miles to Vernon and got married,” Vernon concludes. They reiterated they history jointly with terse statements, which complimented each other. But while their words were plain and stripped of romantic overtones the look which they exchanged was eloquent evidence that the bond between is just as strong as it was when they were runaway school kids. They make an attractive couple: Vernon is a handsome, wide-shouldered athletic six-footer of 40 whose sandy hair (now turned grey) curls much in the same manner of his famous son.